This is our blog. We write about life in the Florida Keys. It involves a lot of food, life with animals, and other stuff too. This post is my contribution for February's "food is love" prompt in Vegan Month of Food world, but is also a little update about things. I've not felt up to shooting videos for a while. The red tape boondoggle has continued, and it takes a toll on every level for us; financially, emotionally, physically (yeah, don't ask me why but stress sure does manifest with physical issues, right?) So, instead I've been working a couple jobs sometimes with odd hours. I've been treated to rising in pre-dawn hours which at times allows me to see the sunrise as I drive up the Keys, and also at times driving home very late with largely vacant roads (although still seem to find the annoying drivers who just "have" to pass in no pass zones.... ugh). The kitchen here is still not up to speed, so my forays into food preparation are nothing complicated. I'm really looking forward to summertime when the fruits and more veggies are back in season, not really sure what will come our way in post-Irma world of growing (so many farmers on the mainland took a huge hit, not just our local beloveds like the Grimal Grove) but I am sure there will be more variety coming down the pike. So, this is February, and many people turn to thoughts of love because well, Valentine's Day. In years past, I've always made an extra nice presentation here at the bed and breakfast for guests, this year that was off the radar since we're still closed. 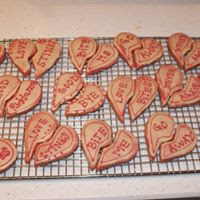 I did reminisce though to the times I offered up "Single Awareness Day" cookies for the stores. This year Valentines Day came and went with zero pomp or festivities. I have had it on my mind though to work more with aquafaba, so I took a crack at Valentines macarons, since my prior attempts at macarons with aquafaba had come out perfectly. You'll note there are no pictures here of Valentines macarons..... you do that math. One of the perks of working in a natural foods cafe is the aquafaba. It comes my way. In copious amounts if I want. Since we finally have a freezer again for the last couple months or so, I have a few items back on ice in larger quantities, well ok 2 items... frozen wild blueberries and a bit of frozen aquafaba once again. Although I enjoy the concept of meringues, I seriously do not like the taste. Sugar, pure sugar, just far too sweet for me. But, I have fun from time to time making things out of little meringues. Since I'm a fan of chocolate, I've been wanting to make a chocolate meringue, but you must remember oils/fats are the enemy of meringues. As I was wiling my night away (insomnia....) a few weeks ago, I found a method for chocolate meringues. I improvised a little bit, and then a little bit more. 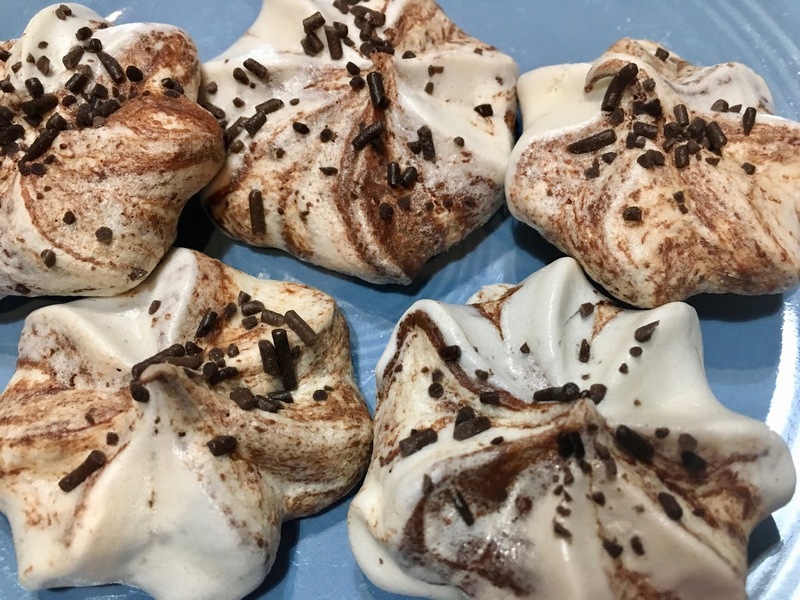 The method on line was to make your aquafaba meringues, and then fold melted cooled chocolate into the meringue batter. When I followed this method, little by little the meringues deflated. But the flavor..... ooh, the flavor! So wonderful! Perfect flavor, but the structure.... not so much. I then got to thinking more about filling them. I piped little discs onto the parchment, and then piped bits of cooled melted vegan chocolate onto the discs. 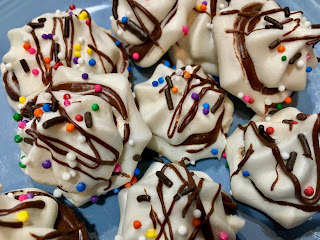 I took a toothpick and swirled the chocolate just a bit on each one, and then piped a vegan aquafaba meringue "kiss" on top of every one. See? As you can see, the meringues were much more full bodied this way. I drizzled some additional melted chocolate on them too. I've made the chocolate filled meringues a few more times, each time with varying degrees of success. 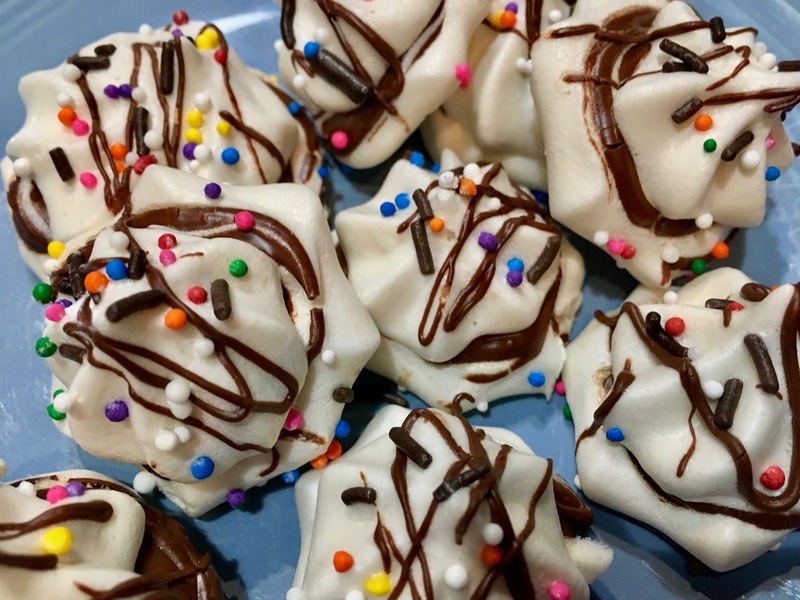 No matter what, the chocolate contacts the meringue, and that causes them to deflate to a certain extent. My next batch will be the last method... I'm going to pipe larger "kiss" style meringues onto the parchment, and then with a smaller nozzle I intend to inject the chocolate into each meringue then dry. I also will try half of the batch in my dehydrator instead of the oven method just to test the differences. People everywhere seem to love meringues. I brought the chocolate ones to the store cafe where I'm working and people went mad for them, which made me happy. Anything cruelty free that brings to smiles about is what it's about. I missed last month's prompt, it was "creating warmth." I'm still going to work on my creation, I desperately wanted to veganize my mothers stroganoff, but I couldn't find eggless noodles, and worse yet, her tiny yellow recipe book (remember that thing from a video years ago?) is MIA since Irma. There's hardly any recipes in there to begin with, but it had the stroganoff recipe... she used dead cow back in the day I have extra mushrooms, or if I change my mind I will forage for a bag of vegan crumbles conveniently for sale in the store of the cafe where I'm working. I have a bag of beautiful organic mushrooms again in the fridge, I'm so hoping I can find her book, because as a little miracle I did finally find eggless noodles while up on a very short road trip to the mainland last week. I have tomorrow as a day off and my intentions are of course spend half my time doing administrative work that all of us are coping with in post Irma world, but the other half of the day is devoted to locating mom's book and veganizing that recipe. As I always say... hope springs eternal. So, there's my contribution for "food is love" during the month of February (today is the 27th... I'm a day ahead, right? haha!) I hope you've been continuing to follow the monthly mini prompts on the VeganMoFo site, and that you're continuing to follow along the happenings here at the inn. We're getting there, slowly but sure, we're getting there. In just about another month or so, it looks like the kitchen will be back to almost full function too.... makes me look forward to all the wonderful prompts coming down the pike for VeganMoFo! Your meringues look fantastic; no surprise that they were such a hit! All the red tape sounds extremely frustrating; fingers crossed that things will start to move along more smoothly for you! Happy to see you're back MiniMoFo-ing again, and making some progress with the b&b. Those meringues look amazing! You’ve got a book in here somewhere. I always look forward to your posts and drool at your creations.